Fine tune your Mental Game! University based laboratory research has shown that ACE significantly improves putting performance as well as making your golf game more consistent. The HPP process taps into your most successful golf experiences and then removes emotional blocks that get in the way of your game. This scientifically developed process allows you to effortlessly and intuitively improve your game! 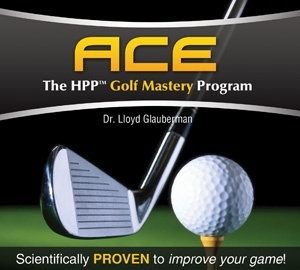 ACE: The HPP Golf Mastery Program is part of a very powerful series of audio programs that employ a storytelling technology called Hypno-Peripheral Processing (HPP). Developed by Dr. Lloyd Glauberman, HPP is designed to bypass consciousness without the use of subliminal messages. This is accomplished by having two specially constructed stories play simultaneously, one in each ear. This gentle audio overload leads you into a deeply relaxed state, ideal for the absorption of messages and suggestions which are embedded in the stories. Listening to this audio program will lead to spontaneous and intuitive changes in thinking, feeling, sensing and behaving - allowing you to play a better and more consistent golf game. For more information about this audio program, Dr. Glauberman and HPP, visit our website and online community at HPPcds.com. 1. Listen to this program in a quiet place where you can relax. 3. Do nothing else while listening. Each HPP audio program contains several 20 minute tracks. Listen to one new track each day until you have run through the program twice. Afterward, you can replay programs as needed for reinforcement. NEVER LISTEN TO HPP PROGRAMS WHILE DRIVING AN AUTOMOBILE!